The Wilson Staff Triton driver as seen on the Driver vs. Driver TV Show is designed to maximize sweet spot contact and deliver unmatched performance. It features a 460cc head with revolutionary 1:1 Visible Swing Active crown feature Technology coupled with Fast Fit Technology which is one of the easiest and lightest adjustable hosel systems available. The innovative Wilson Staff Triton driver has 2 changeable sole plates (22 gram titanium and 9 gram Carbon Fiber) and 5 moveable weights ( 2 Black 2 grams, 2 Red 6 grams, Silver 12 grams) which allow the player to fine tune the ball flight to their preference like never before. 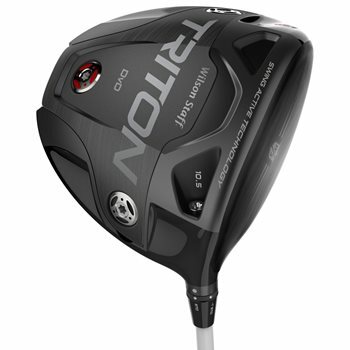 You can adjust the loft -1/+2 degrees from the standard loft and the interchangeable face plates, 18 unique weight combinations and 10 (no upcharge) shaft options make this the driver that fits any and every golfer. Review by Mitchell, 1 year ago. Does this used club come with all the accessories? extra sole plates, weights, and wrench? Thanks! Does this come with both face plates and weights? Does this club come with all of the swing weights, face plates, and wrench ?